Hello, hello. You’re now tuned to your favorite blog: micro-writers.egybio.net. Tonight we have this very special guest, live, online. After two months of waiting, we finally got this exclusive interview with the emerged Streptococcus pyogenes strain, the most dangerous ever, M1T1. We have it here, with us, in the studio. – Hello, M1T1. Welcome in our studio. – We knew from our resources, which are totally classified, that you got yourself in trouble recently. – (Interrupting), I did NOT get myself in trouble. EID set me up. – M1T1, Would you please calm down & tell us a little more about yourself? – Well, I belong to Group A streptococci (GAS) aka Streptococcus pyogenes. M1T1 is my serotype; I’m just a clonal strain. As you know, S. pyogenes colonize human skin & throat causing either non-invasive (sore throat, tonsillitis & impetigo) or invasive (necrotizing fasciitis NF, scarlet fever & streptococcal toxic-shock syndrome STSS) infections. Actually, NF gave me my nick: Flesh-eating bacteria. – So, you cause all people NF & STSS? – No, kid. It depends on their genetic susceptibility, what you call “Host–pathogen interactions”. I was isolated from patients with invasive as well as non-invasive infections during 1992–2002. This is NOT entirely my fault; humans can make me extra virulent by selecting the most virulent members. – Back to your history, when have you exactly been isolated? – M1 & her sisters were the worst nightmare in US & UK in the 19th century as they caused the famous pandemic of scarlet fever. “Nevertheless”, early 1980s was the golden age of my strain as well as my very close sisters M3T3 & M18. We caused STSS & NF in different parts of the world. Great times, great times! – Only for you, I suppose! So, what made you hypervirulent? What caused you this “epidemiologic shift”? – Two reasons Dr Ramy K. Aziz identified that improved my fitness to humans: the new genes I got from phages & “host-imposed pressure”. Both resulted in the selection & survival of me M1T1 the hypervirulent strain. Dr Aziz’s work at Dr Kotb’s lab resulted in identification of a group of genes I got from phages that changed my entire life. – Interesting! Tell us more about that. How did phages “change your life”? 1. SPhinX which carries a gene encodes the potent superantigen SpeA or pyrogenic exotoxin A (scarlet fever toxin). 2. PhiRamid which carries another gene encodes the most potent streptococcal nuclease ever, Sda1. 3. He also found that phages conversion from the lytic state to the lysogenic state resulted in exchange of toxins between our different strains (aka Horizontal Gene Transfer). Phages are very good genetic material transporters, what makes “strains belonging to the same serotype may have different virulence components carried by the same or highly similar phages & those belonging to different serotypes may have identical phage-encoded toxins.” What a quote from Rise and Persistence of Global M1T1 Clone of Streptococcus pyogenes. – Well, It was not that interesting. So, what? What’s the significance? How that made you hypervirulent? – You can’t get it? You’re not that smart, are you? Tell me, what made M1 hypervirulent causing scarlet fever in the 1920s and me hypervirulent causing STSS in the 1980s with a 50-years decline period? – Exactly. You do have your moments! Superantigen encoding-gene was present in us and absent in strains isolated in the period between them. The interesting part, for me of course, that humans after 50 years of absence of hypervirulent strains had absolutely no superantigen-neutralizing antibodies. That was the real invasive party. Superantigen causes high inflammatory response because of its non-specific binding to immune system components (antibodies & complements) causing an extremely high inflammatory response. In fact, SuperAg inflammatory response is “host-controlled”. – So, what about Sda1? – Streptodornase (streptococcal extracellular nuclease) helps me to degrade neutrophils that entrap me in the neutrophil extracellular traps (NETs). 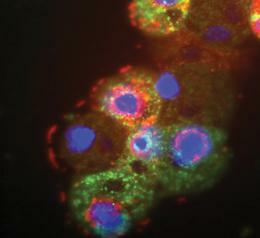 So, I can invade humans freely & efficiently and be able to live in their neutrophils. Dr Aziz proved in his paper “Post-proteomic identification of a novel phage-encoded streptodornase, Sda1, in invasive M1T1 Streptococcus pyogenes” that it’s all about C-terminus in my Sda1; the frame-shift mutation increased my virulence while deletion decreased it. – Now we know about your SuperAg & nuclease (DNase), what’s the “host-imposed pressure”? – I have my own SpeB (Protease), I use it to degrade my other proteins (virulence factors), which provides me with a good camouflage & gives me access to blood. When the host immune system recognizes me, it traps me in NETs. At this time, I secret Sda1 to degrade neutrophils. Actually, SpeB protects you, humans, from my Sda1& my other toxins. When SpeB was compared in patients with severe & non-severe strep infections, it was found that SpeB wasn’t expressed in case of severe infection. Expression of SpeB may be host-controlled, as host selects the mutants with a mutation in covS, a part of my regulatory system which regulates my gene expression including SpeB gene. – Finally, M1T1. How do you see your future? – More new phage-encoded genes, more selection of the hypervirulent strains by the host & more regulation of expression of my virulence factors. Pretty good future! I also count on humans to not develop immunity against me like what happened in 1980, when I got new virulence factors or allelic variations in my old ones. Thank you, M1T1. Pleasure talking to you…….M1T1? M1T1, where are you? Why do I feel this strange pain in my throat? Once upon a time, in 2003, a French team discovered a giant virus infects amoeba. It was isolated from a cooling tower in the UK. They were so excited because it was so huge with a genome contains 900 protein-encoding genes (The words giant/ huge are totally hilarious. It’s not “Hulk”, it’s just a virus). It’s visible under the optical microscope. They named it Acanthamoeba polyphaga mimivirus (APMV). The prefix “mimi” is for mimicking microbe. Now, the same team “Raoult’s team” reported the isolation of another strain of those giant viruses but this time it was isolated from a cooling tower in Paris. They named it “mamavirus” because it was slightly larger than the previous giant virus (APMV), but it wasn’t alone. It was associated with its satellite, a small virus has 21 protein-encoding genes infects it, hijacks its viral factory making copies of itself, hindering the ability of the mamavirus to replicate/ make its own copies, so the number of the mamavirus drops in the infected amoebae. They named it Sputnik after the first man-made satellite. It’ll be the first isolated “Virophage”. How did I know about it? From the amazing blog of Dr. Ramy K. Aziz, “Microbes“. The story won’t stop at this discovery. The discovery of the virophage will strongly suggest that “Viruses are alive” because they share something with other living domains of life, they can be infected, they can get sick, what makes all health-care providers totally thrilled because there’s something stronger than viruses which could be used to fight them, but “It’s too early to say we could use Sputnik as a weapon against big viruses or to modify them,” says co-author Bernard La Scola. One more thing about Sputnik, 3 of its genes are closely related to APMV which suggests horizontal gene transfer between giant viruses caused by Sputnik. This is so “bacteriophagic”, reminds me with the whole insertion/ lysogenic mechanism between phages & bacteria. The isolated sequences from the ocean are closely related to the genome sequences of giant viruses & their satellite (Sputnik) . They infect plankton. “It suggests there are other representatives of this viral family out there in the environment,” Koonin says.